Just bring your trash and recycling to the carts right outside your door and ACUA’s collection staff will retrieve the containers from the residence, empty them and return them to the residence. Participating residents will NOT need to bring containers to the curb. Brigantine, Ventnor, Margate and Longport Residents who currently have curbside collection. 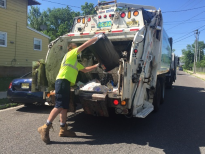 Trash Collection: All trash must be placed in the 96-gallon trash cart. ACUA will collect up to two 96-gallon wheeled trash carts at each property on your scheduled collection day. Recycling Collection: All recycling must be placed in the 96-gallon recycling cart. The ACUA will collect up to two recycling carts at each property on the scheduled collection day. Additional 96-gallon trash or recycling carts are available for purchase at $75. Residents may continue to use the 96-gallon carts during the year, even when Valet Season ends. Note: Valet service does not include yard waste collection, construction debris or metals, or bulky collection. Please follow your town's regular schedule for this service. Condominiums, apartments and commercial establishments are not eligible for valet service. Residents will need to apply prior to 12pm on Thursday, April 18 to begin service from the start date of April 22. If a resident applies after a service period begins, rates will not be pro-rated and the full rate for that service period will be charged. In addition, if a resident applies after a service period begins, service will begin the following week (i.e. the resident applies on a Wednesday and has a Thursday collection, they will begin Valet collection on Thursday of the following week). Containers may not be stored in sheds or garages, must not be blocked, and a clear path must be accessible. If access to the carts is blocked or restricted then we will have to leave the material behind. Please complete the online application by selecting your town below and make payment via credit card or check. If you have any questions, please contact the ACUA at 609-272-6950.